Welcome to Onrush. A three-way lovechild of Motorstorm, Burnout and Overwatch. Birthed during a violent coke binge, with gummy worms and sherbet saucers. Evo Studios, formally Evolution Studios, are no strangers to racing games, having previously made the Playstation exclusives Driveclub and, the much missed, MotorStorm. Onrush is an entirely different beast and their first multiplatform game that keeps with the studio's tradition of putting two words together with no space in-between. There's no coming first, in Onrush, as you're not exactly racing. More striving to gain the upper hand, over the opposition. Sticking and working together as a pack, with your team, to outdrive, outmanoeuvre, outscore and wreck the rivals, is the goal. Learning every possible route of the map becomes equally and just an integral as learning the nuances of each vehicle type. Vehicles are split into four classes, light to Heavy, with two in each class. Each with their own set of advantages and perks. All vehicles come with Boost. Burning off Boost feeds your Rush tank. Hitting Rush sends you into a destructive rage while omitting a blue aura, giving you exceptional speed and velocity to spearhead through the rivals, while also giving off your chosen vehicle’s unique perk. 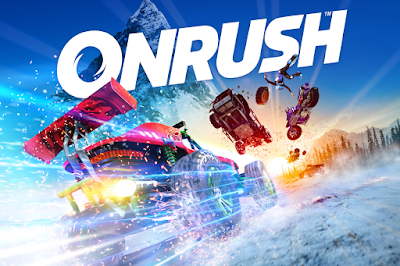 Onrush consists of four main game types. During Countdown everyone needs to get through as many of the checkpoints as possible, to delay the team's timer from dropping to zero and losing the round. This causes some great stampeding herd moments, as everyone attempts to try simultaneous occupy the same space. Overdrive is a test of speed. Take big jumps, risky manoeuvres and smash the other cars, off the track, to keep the Boost meter filled; keeping a combo going for as long as possible to earn more points faster than the orange team. Lockout works similar to King of the Hill, with all combatants trying to catch up and take control of a moving zone. Lastly, there's Switch. Every player gets three lives to take out the opposing team. The catch is you switch vehicle class each time you wreck; starting from the lightest, the bikes and ending the heavyweights. These modes will be taught to you through Superstar, which works as a single player mode Campaign, forcing some not really necessary story into the game but more importantly, teaching all the rules of the game and giving you a chance to try out each of the vehicles, game types and maps without the judgemental eyes of those online. Quickplay is your standard, join a random game online. Unlike a lot of games, however, this works extremely well. I’ve never had to wait for players to join and been left waiting, in a lobby. The magic of Onrush is under the hood, so to speak. The game's engine allows for an insane amount of things to be happening at any one time, while things you wouldn't generally even notice are happening, simultaneously. Water will pool as it rains and snow will get deeper, during a blizzard. Dirt and snow will get stuck and build up between tyre treads and your vehicle will amalgamate a buildup of dynamic dirt and damage. All this while running at a nearly flawless 60 FPS. The soundtrack of Onrush helps fuel the feeling of its intensity and speed, much the same way as the Wipeout series has always utilised an EDM soundtrack. With Evo's partnering with Ninja Tune, they were able to use many of their top artists; including one of my personal favourites, The Qemists. The dynamic way the audio shifts as you Wreck. Faze in or get some air, and graciously freewill after launching off a cliff’s edge and land, crushing an unsuspecting rival, adds to the overall impact. I can see Onrush as being a game I’ll keep coming back to, over time, for a few races before turning off my machine and to fill the gap between other games. This will be this generation's SSX.